Our pavilion at Mobile World Congress. I just returned from this year’s Mobile World Congress, and, as usual, the people, the energy and the innovation have left me excited and confident about what’s ahead for mobile. 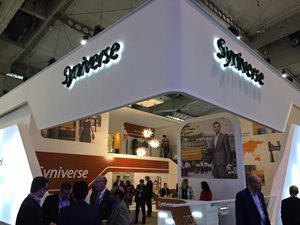 This year, an amazing 108,000 attendees from over 200 countries came to the event, where Syniverse, as usual, set up a large pavilion and hosted about 300 meetings with customers, industry colleagues, media representatives, and analysts. The show offers one of the few times of the year when I can meet with many customers at the same place, and I had the opportunity to have a lot of fascinating conversations about some of the latest issues and trends in mobile. One of these among others emerged as particularly compelling that I would like to share here. Specifically, banks and other financial companies are being challenged as never before to deliver a connected personalized experience between their brand and customers at multiple touch points. Among the daily, sometimes hourly, customer needs that must be addressed instantly now are, What’s my account balance? How can I make a payment this afternoon? And how are my investments doing right now? Being able to respond to these requests in a quick and personalized way has become a must for banks. Fortunately, our mobile device can now to serve as a convergence point for all these interactions, with the upside that we can measure these interactions in real time and react quickly to provide personalized service. However, in orchestrating this customer journey, it was clear from our discussions at Mobile World Congress that banks are struggling to coordinate the details to drive value in many customer interactions, in both in-person occurrences such as with a teller at a branch office, as well as in mobile experiences like using the services available through a bank’s apps. We discussed several critical goals for this customer journey, including reducing customer churn, enhancing payment card usage, increasing application downloads, and improving conversion rates. The common denominator that came to light was the need to quickly and effectively move customers from the awareness stage to the loyalty stage with bank services. A simple but technologically smart answer to this question is mobile wallet. We showcased this tool at Mobile World Congress with operators, cable providers, OTTs, and enterprises, and they all agreed on the potential of leveraging this platform to become more relevant in their customers’ digital life. Mobile wallet is a channel that offers a fresh and underappreciated approach to engaging banking customers. It has a one-of-a-kind capability to seamlessly deliver account statements and transaction updates and payment options straight to a customer’s phone, at a place on the phone where they can easily be accessed. In fact, the name “mobile wallet” is somewhat of a misnomer since this tool is not so much a payment tool as it is a versatile space that provides an open stream into a customer’s phone through a native application. Mobile wallet can play a crucial part at many stages of the customer journey. Real-time automatic updating – In addition to the convenience of its ease of access, mobile wallet offers the value of automatic updating. Banks can update customers’ mobile wallet items without requiring any steps on the customer end, and these updates can be pushed to the device’s lock screen for immediate viewing and access. More detailed ROI measurement – Mobile wallet also offers a powerful channel for marketing campaigns, since campaigns can be targeted to certain customer segments, set to only be operational in specific locations, programmed so they can be instantly updated, and tracked through barcodes. This allows banks to measure with great precision the effectiveness of campaigns for such initiatives as introducing new services or making new account-management tools available. Complement to apps – Another important advantage of mobile wallet is that, as a native application prebuilt on a phone rather than a downloaded app, it complements apps by enabling a quick-touch experience compared with the more in-depth experience of apps. Mobile wallet and mobile apps can play off one another, where the app can be used to deliver offers to be saved to mobile wallet, and where the mobile wallet can be used to promote app adoption through links to an app store. As banking customers continue to look for more real-time personalized and service, mobile wallet will offer an increasingly valuable tool for banks to more dynamically engage their customers. It was insightful to get our customers’ perspectives on this area at Mobile World Congress, and it’s an area that Syniverse looks forward to being closely involved in this year.